You finally did it! You got a gym membership. If you're pumped to get started, but a little nervous at the same time, don't sweat it. Almost everyone is a little bewildered when they first enter a gym. Where do you even start? The key is not to try to do everything at first, says Los Angeles-based fitness coach Andrew Heffernan. “Learn a few moves, work till you feel a little sweaty and leave before you get exhausted or bored,” he says. And don't forget to keep an open mind. You might look a little awkward in the process, but in a few weeks you'll be feeling much more confident — especially when you start to see results. In the meantime, let this be your survival guide as you navigate the rewarding (but sometimes confusing) gym world. Setting foot in the gym is the hardest part. Certified personal trainer Jacque Crockford suggests taking the guesswork out of your first day by setting up a meeting with a member of the fitness staff. “Whether this is a personal trainer, fitness specialist or front-desk team member, it’s important to have a tour of the facility, understand the club culture, ask questions and perhaps get a few demonstrations of some equipment you find interesting,” she says. After that, Crockford recommends scheduling a more in-depth consultation with a personal trainer or certified health coach. 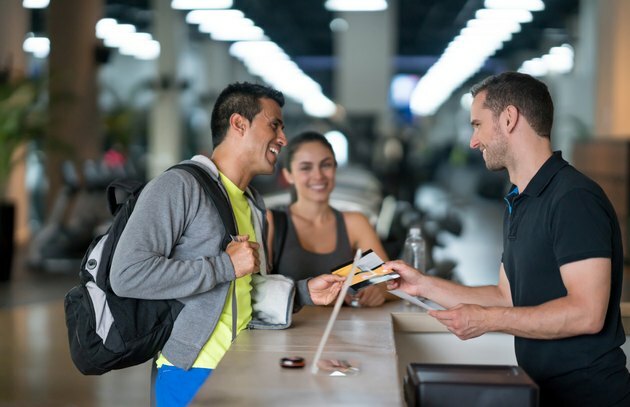 “They will be able to help you with the next part of the equation — understanding your ‘why.’” Once you identify your reason for joining a gym in the first place, your trainer can start showing you how to achieve those goals. Many gyms offer a free introductory session with a trainer, or you can invest in a low-commitment single session — which will help you become comfortable more quickly. Want to stay in the game or become a gym dropout? These tips will set you off for a successful start to your gym experience. Having a plan is essential when you’re just starting out. Knowing what you’re going to do when you get in there will prevent you from wandering aimlessly or feeling self-conscious about your lack of direction. If you decide to skip the introductory personal trainer meeting, having a plan is even more important. What does that look like? No need to write down the exact exercises, sets or reps. 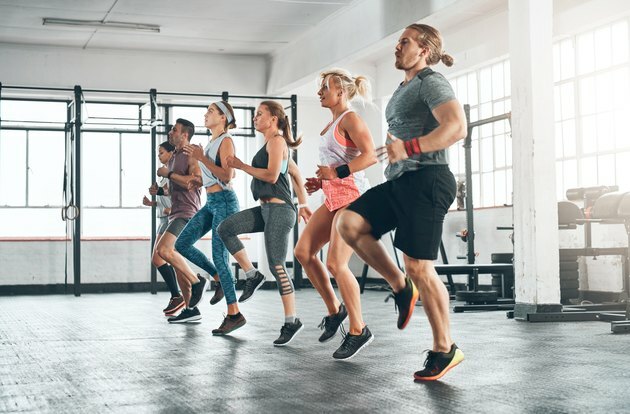 It might be a general thought — an intention to do 20 minutes of cardio, 15 minutes of body-weight exercises and finishing off with a 10-minute stretch. The details will come about with time. Common rookie mistake: Joining a gym, hitting it hard every day, getting burned out and then quitting the gym. If there's one thing you shouldn't do, it's that! “You’re starting a lifelong habit: Don’t try to make up for months or years of inactivity in one workout,” says Heffernan. Keep your cardio sessions brief and easy. Get your heart rate up and sweat a little, but don’t wipe yourself out. 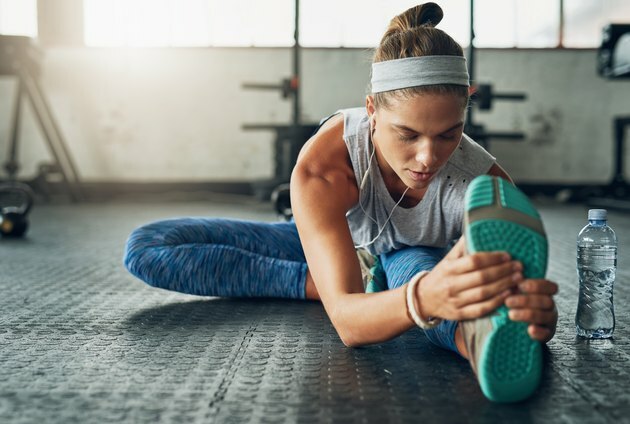 Keeping the intensity low in your first few weeks will also help lessen a lot of post-workout soreness, which can be another deterrent for people trying to make fitness a habit. A large gym can have hundreds of pieces of equipment which, to a beginner, may or may not look like contraptions that you'd need a manual to decipher. No need to worry about it! Just learn a few basic pieces of equipment and a handful of exercises that will carry you through your first few weeks at the gym. In a typical gym, the cardio equipment will be grouped together in one area. Most cardio equipment works in a similar (and very easy) manner: You get on, set a program on the display and get moving. Typically, using a treadmill requires very little skill and comes with a slim chance of error. The easiest way to start is to press the "Quick Start" button (go figure). Once you get going, you'll be able to adjust the speed and incline using the “+” and “-” buttons on this manual setting. Start off with an easy walking pace, then explore more challenging settings once you feel comfortable. Don't worry — you don’t even need to know how to ride a regular bike to ride a stationary bike. Just put your feet on the pedals and start pushing. You may need to adjust the seat, which is typically done by pulling the knob out, raising or lowering the seat, and then popping the knob back in. As you pedal, you can play around with adjusting the resistance and exploring some of the preprogrammed workouts on the display panel. 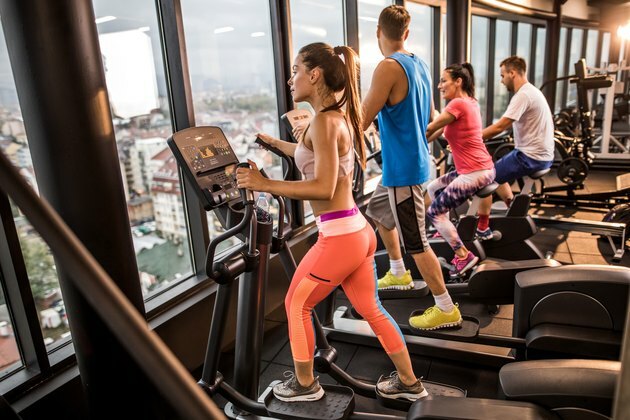 The elliptical machine is one of the trickier pieces of equipment on the cardio floor because the movement doesn’t mimic anything in real life. It’s kind of like a treadmill, but kind of like a stationary bike. To use it, you place your feet on the pedals and hold onto the handles, which will either be stationary or move back and forth. Press your feet forward and down to start pedaling; if the handles move, push one away from you while pulling the other handle toward you. The timing is a little tricky, but with practice you’ll find your rhythm. This machine will either look like a set of stairs or it will be more compact with two pedals and some static handles. It’s sometimes mistaken for an elliptical, but it's not quite the same. On the larger set of stairs, you’ll get on and immediately start climbing; the weight of your body sets the stairs in motion. However, you’ll need to set a program or press the quick-start button to get the stairs to move faster. You can control how fast the stairs move and track your pace and floors climbed. For the more compact version, you’ll step on the pedals, hold the handles and start stepping. Set your program on the display to increase or decrease the speed and track your data. Close your eyes and picture the weight room. Is it filled with burly men pumping iron and grunting? There is certainly that contingent at almost every gym, but times are a'changing. Most of the people working out at any gym are just like you. When you’re new to the gym, you don’t really need any equipment at all. Your focus should be on learning the movements of exercises you may later do with weights. To get you started, try some of the best body-weight exercises. Then put them into a full-body body-weight workout. However, it’s helpful to know what your options are when you are ready to hit the weights. Here are your two main options. They’re also often arranged in a circuit that hits all the major muscle groups. If you follow the circuit, you don’t have to think about what exercise you’re going to do next. As an added bonus, they usually have instructions printed on the side. Heffernan recommends using compound exercise machines. Compound exercises involve moving more than one joint at a time through a large range of motion, such as chest presses, rows, lat pulldowns and leg presses. These exercises work several muscle groups at once, which gives you more bang for your buck. “Single-joint exercises like curls, triceps pushdowns, lateral raises, leg curls and leg extensions can be fun, but they don’t do as much for you as compound movements,” says Heffernan. The most difficult part of using a weight machine is adjusting the seat and the weight stack. Typically, the seat moves either up and down or forward and back, depending on the machine. Always look for the knob located near the seat. You should be able to pull that knob out, reposition the seat, then release the knob. A weight stack looks exactly the way it sounds: It’s a stack of weights with a pin that inserts into each weight. To adjust the weight, simply insert the pin into the weight you want to lift. Free weights are easy to identify because you can pick them up and hold them. Dumbbells, barbells and kettlebells are the most common examples. But when you’re first starting out at the gym, they don’t need to be a high priority. Morrison agrees: “For someone brand-new to the gym scene, simpler is always better.” He suggests starting with body-weight movements like squats, lunges, planks and push-ups to begin working on technique and building strength as well as coordination. “As these movements begin to present less of a challenge, they can be advanced by adding external loads like dumbbells, kettlebells or barbells,” he says. When you’re starting out, choose a few different body-weight exercises and focus on quality of movement over quantity. “Low resistance for medium to high reps will teach your body all it needs in the first few weeks of a training program. Think one to two sets of 12 to 20 reps,” says Heffernan. Most gyms offer classes. Some even have an extensive class schedule with everything from strength training to Zumba. “If you’re new to fitness, group classes can be a great way to meet like-minded people and learn something new,” says Crawford. Check out your gym’s class schedule to see what sounds interesting and what fits your schedule. “Be sure to say hi to the instructor before class, and let them know you’re new to the class,” says Crawford. It’s also in your favor to tell the instructor you’re new to exercise and ask if the class is appropriate. If not, put it on your calendar for next month when you’re less of a newbie. 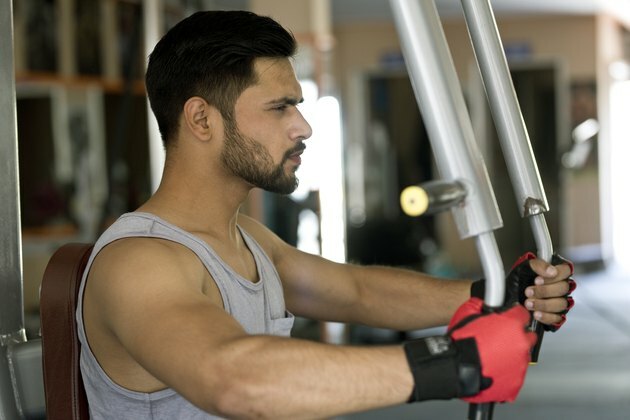 The gym can be a very intimidating place for a newbie, particularly when it comes to a lack of knowledge regarding gym etiquette. “Luckily, the majority of the ‘unwritten rules’ follow basic principles of common courtesy,” says Morrison. 1. Clean up after yourself — both weights and sweat. This is huge and No. 1 on the list for a reason. 2. Try to give other lifters enough personal space so they don’t feel like they’ll hit you while swinging around a kettlebell. 3. If you also need to use a piece of equipment, ask if you can share with the current user (or just come back to it later). 4. Try not to spend too much time at one station (or be open to allowing other people to work in with you). 5. And, most importantly, never, ever, ever do curls in the squat rack. What do you find most intimidating about joining a new gym? Do you prefer working the cardio machines or the weights section? What other beginners' information would you like to learn about? Let us know in the comments section.